It was July 1943. Parked on the ramp of Sunrise Airport at Tifton, Georgia, was a P-40F painted in wartime camouflage. To a pilot with a total of about 190 hours, all in trainer aircraft, this was an impressive sight. Stories were coming in from North Africa, where American Warhawks and British Kittyhawks of the Desert Air Force were harassing Rommel’s army and shooting down German aircraft. The Palm Sunday Massacre had taken place the previous April, when Desert Air Force fighters—mostly P-40s—had shot down sixty-five German aircraft as they desperately attempted to get out of Cape Bon. This was a real warplane, one that I had wanted to fly for four years. My time had come. Then, in June 1943, when I was in basic flying school at Shaw Field in Sumter, South Carolina, a combat veteran from Africa came through, flying his P-40 around the country, on a war-bond drive. Of course, the Flying Tigers had in the meantime made a great record with their P-40s against the Zeroes. I had waited a long time, and finally here was my chance. Fighter pilots are a proud lot—some people say conceited. One of the main reasons is the fact that the pilot can receive instruction only on the ground. He has to fly the airplane alone his first time up. Other pilots have several hours of dual time in the air, with an experienced, qualified pilot in their aircraft. So for a student fighter pilot who would not get his wings for more than three more weeks, taking up a brand new kind of airplane was a challenge. My aircraft was number 55 and had the name Stinkie painted on the fuselage. Thirty-five years later, some of the details have been forgotten. However, many impressions remain. The 1,000-horsepower Rolls-Royce Merlin engine was almost twice as much power as I had handled so far. In the P-40, as well as the Spitfire and the Jug, we would climb on to the trailing edge of the left (port) wing and then into the cockpit. The Spitfire had a horizontally hinged flap on the port side of the cockpit that let down permitting easier entry. The crew chief standing on the left wing would help us with the chute and harness straps after we were seated. There was enough room in the cockpit for a six-footer whose height was in his long legs. It was a comfortable arrangement in there, with good visibility, except straight ahead, where the P-40’s long nose blocked the view. My instructor led me through the steps in starting the engine, although I had practiced this several times by myself in simulated cockpit drills. When the engine actually started, I realized that I was on my own. I have forgotten the exact details of engine start for the three aircraft, and although between them there were minor differences, I am sure nothing stands out in my memory. Aside from the ever-present problem of overheat on the liquid-cooled engine, starting was simple and routine. The P-40 Warhawk and the Jug had the standard U.S. braking system of individual toe brakes on each rudder. That is, right rudder—right brake, left rudder—left brake. Both had a steerable tailwheel which responded to rudder movement, but most steering was by differential braking. I personally never landed nor took off in a fighter with my heels on the floor; I always put my feet up on the pedals for takeoff and landing, and heels on the floor for taxiing and flying. Taxiing was not difficult, as we had been taught since our first flight in a primary trainer always to “S” to clear the view dead ahead. But in Italy, we were flying P-40s off dirt strips with a heavy dust problem so the crew chief rode sitting on the leading edge of the left wing astride the pitot tube wearing dust goggles. He would direct our taxiing with hand signals to avoid any chance of collision. As we turned onto the runway, lining up for takeoff, he would jump off, salute us (his pilot), and we would be off. Both in Corsica and France with the P-47, although there was no problem of dust on the hard-packed ground at Istres and on the sod of Amberieu, we kept up the crew chief system of riding the wing. In Africa, in the Spit, we taxied alone. The pre-takeoff drill in the P-40 of checking propeller controls, magneto, oil pressure and temperature was routine. This liquid-cooled engine on a hot July day in Georgia was quick to overheat and the acrid smell of coolant was one that always seemed present. The P-40 was a development of the radial-engined P-36. The long liquid-cooled engine placed the propeller several feet farther from the center of gravity than it was on the P-36, so that the torque was greatly increased. On takeoff it was necessary to turn in a good bit of right rudder trim from the control in the cockpit. As the aircraft accelerated along the runway, the effect of torque increased and had to be corrected by proper application of right rudder. The reverse was true in a dive, and it was a standing joke that all P-40 pilots had very highly developed calf muscles as a result of this characteristic. Having been briefed on all this, a pilot on his first flight was ready, but it was still a difficult thing to control. On takeoff the aircraft would yaw from right to left and back. As the pilot made his corrections, the hot exhaust would blast into the cockpit from six exhaust stacks on each side of the cowling. We took off and landed with the canopy open as a safety measure in case of a crash, and this sudden blast of heat added to the confusion and excitement of a first flight in this fighter. To complicate matters, there was a very strange procedure necessary to raise the gear. The gear handle was placed in the “up” position with the left hand, and at the same time a trigger at the bottom of the pistol grip on the stick was squeezed with the right little finger. (The trigger at the top of the pistol grip squeezed by the index finger fired the six guns!) Next we swapped hands, as it was necessary to check the gear position by pumping the handle of the hydraulic lever located on the right of the cockpit, while controlling the climb with the left hand holding the control stick. Then there was another swap of hands to put the gear lever in the “neutral” position. Then the canopy was cranked shut, with its handle on the right-side canopy track. Once one mastered this technique, the climb was easy, and the aircraft was nice to fly. The rate of climb and the evidence of power were much greater than I had previously experienced and were a great thrill for an aspiring fighter pilot. Leveling out at 10,000 feet (we were not equipped for using oxygen), this airplane flew beautifully. Slow rolls were particularly easy to do, as the Warhawk just seemed to be designed to roll on the axis of that long nose. Loops also came smoothly, as did the standard chandelles, lazy eights, Immelmans, and Cuban eights. We had been instructed not to spin the aircraft deliberately, but if we got into a spin, neutralizing the controls and releasing them would bring it out easily. About a year later, I was to find this true in the Liri Valley in Italy. In tight turns, if the controls were coordinated, the aircraft would out-turn any fighter (except maybe the early Spitfires), as the Germans in their Me-109s learned when fighting with the Warhawks in the Mediterranean. A bad turn would result in a snap roll, generally to the right. We were not taught, as the RAF was in Canada, to pull off power. We maintained the same power and pulled into the turn. There was, of course, depending upon the airplane design, the ever-present chance of snapping out; however, this was part of the technique to be learned and practiced. The P-40 could dive very fast. Our technique in combat when dive-bombing consisted of turning in full left rudder trim at 10,000 to 12,000 feet, making a half roll to the left and then a full-power dive onto the target in as close to a vertical altitude as we could estimate from the cockpit. Using the standard 100-mil gunsight, we would pull the nose up through the target and drop our 1,000-pound bomb just after the target disappeared under the nose. By that time we were down to about 2,000 feet and up to 450 miles per hour. We would leave in the left rudder trim during a zoom back to 10,000 to 12,000 feet, yawing in this climb and confounding the gunners on the ground, who would shoot out in front of our nose but not on our flight path. One time in the Liri Valley, after dropping the bomb, I popped into clouds which were scattered at about 10,000 feet. But the deck of clouds was much thicker than I had estimated, and I soon found myself in a spin. Neutralizing the rudder trim with the trim tab control wheel I remembered instructions and turned the controls loose. The aircraft came out of the spin and went into a dive. I came out of the bottom of the cloud in a dive, much too low, I thought, to pull out. But I pulled back hard on the stick and went back into the clouds in a coordinated climb. Popping out of the clouds, I thanked the Warhawk and its stability for my life. After a pilot has been airborne for a while and has put an aircraft through its paces on a first flight, there comes a sense of confidence, even euphoria. Pretty soon, however, the small voice keeps reminding him that he has not landed the aircraft yet (usually the most challenging part of a flight). The P-40 had a narrow landing gear tread, and although the long nose obscured the view dead ahead, I never found it very hard to land. It was heavy and rugged, and although it was not easy to make a perfect landing, it was not any harder to land safely than the primary and advance trainers (PT-17 and AT-6). The procedure for putting the gear down was as complicated as getting it up. Putting the flaps down was just as complicated, but aside from that, I could bring it in safely, sometimes very smoothly. That successful first flight in a modern high-performance fighter, before even graduating from advanced training and before getting our wings and pilot’s rating, was a great thrill to all of us. It was an experiment with our class. Most pilots before this had not flown fighters until they had been graduated and had received a pilot’s rating. We continued flying the P-40 for the rest of the week and accumulated about ten hours in eight flights. The P-40 was about equal in speed to its peers the Spitfire and the Me-109. Although it could not climb as fast as either of them, it could dive and turn just as well. In the hands of experienced pilots it could do better than hold its own. Our 324th Fighter Group, which had fought with the Desert Air Force across North Africa from Egypt to Tunisia and through Sicily and Italy, bested the German Me-109 at a better than twoto-one ratio in victories in air-to-air combat. The aircraft’s range and endurance were sufficient for our mission, except for the invasion at Salerno, when our Warhawks, stationed at a distance in Sicily, could only provide very limited beachhead cover. Even though the P-40 had the liquid-cooled engine (considered by most people to be more vulnerable to ground fire than the air-cooled radial engines), it was a rugged sturdy aircraft, a fine combat vehicle. My dogfighting in combat was very limited. Within these limits we felt that full power was best (the more power the better), especially when we were outmatched as we were in the P-40. In training, to avoid undue wear and tear on engines, we would use less power, maybe forty inches of mercury, rather than cruise or takeoff power. The Spit had comparative pounds boost. Altitude was where it occurred, but only fools would try to climb with an Me-109, and diving was the best course of action, as well as turning. Flying damaged aircraft in my experience was done on a case-by-case basis. The vital question was whether even to try to fly it. Fine pilots had been killed when, possibly because of pride, they did not bail out. After deciding that a damaged craft could be flown (and this decision was always subject to change), the best general rule was to stay well within the limits of its capability under the circumstances. In other words, never press one’s luck—be very conservative. None of these lessons in judgment or common sense are included in a manual. Bailing out, like so many other facets of air combat, had to be learned by experience. A fellow officer and tentmate had an unsuccessful bailout using a technique that was generally thought to be effective. This consisted of turning the aircraft on its back and dropping out of the cockpit. Unfortunately, the air flowing past the cockpit would hold the pilot in his seat until the nose of the aircraft fell through into a dive. By this time the pilot was usually unable to clear the plane and was hit in the legs by the tail. My friend lost one leg at the knee. Another pilot in our flight tried to pop out of the cockpit by rolling forward full nose-down elevator trim and turning loose the stick. He was thrown upward as he expected by the sudden nose-down maneuver of the aircraft, but not high enough to avoid both legs being virtually cut off at the knees by the canopy. He died before being picked up by rescue craft. A successful maneuver used by several pilots (including myself) required a certain amount of control of the aircraft. With a dead engine, the canopy was opened and the aircraft put into a shallow climbing turn to the right, holding the airplane in this attitude as long as possible until it was on the verge of a stall. By that time the airflow over the cockpit was not enough to prevent the pilot from climbing out of the cockpit. A dive at the trailing edge of the right wing with the legs tucked up as in a front one-and-a-half somersault off a diving board into a pool, enabled the pilot to clear the aircraft as it went by. Then the chute could be opened. Landing the P-40 was not any different from landing any other aircraft, although there were variations in landing patterns in the various commands. At flying school, the conventional rectangular pattern was used, but in the operational training unit and at Sarasota, Florida, where we had our combat training, the overhead pattern was standard. The aircraft was flown over the landing runway at 1,500 feet at about 200 miles per hour. As it passed over the upwind end the pilot would pull into a tight 90° turn to the left. In the humid air of Sarasota, this maneuver caused vapor trails to form and stream off the wingtips. This spectacular maneuver became a status symbol of a skilled (and daring) pilot. If this sharp turn was coordinated, there was no danger; but if uncoordinated, the aircraft would snap, often into a spin, deadly at 1,500 feet. Aside from the chance of a spin this was a good technique for landing. Gear was dropped on the downwind leg of the pattern, flaps on the base leg, and a three-point landing was made at the end of the final approach. As I remember it, the downwind was flown at about 130 miles per hour, base leg at about 120 miles per hour, and final at about 100 miles per hour. 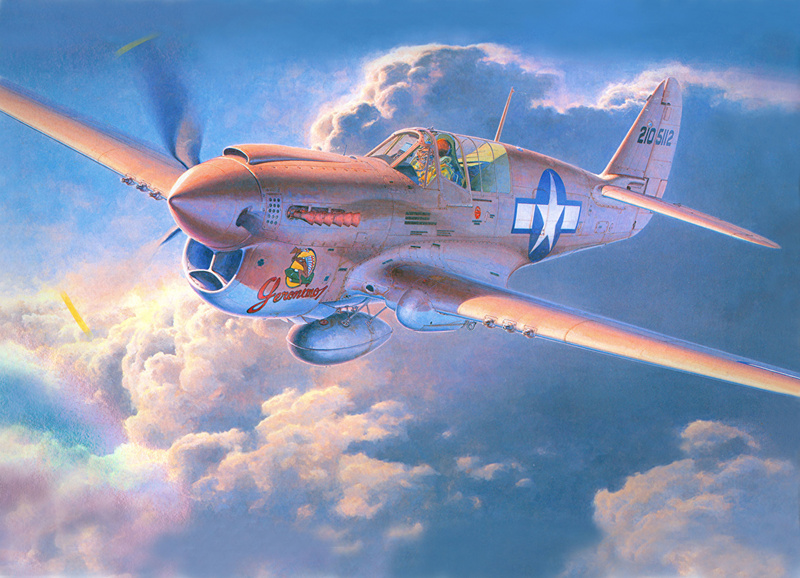 My total time in the P-40 was 225 hours, 123 of which were combat hours, flying seventy-two sorties. We were hard on engines, most of which were rebuilt, and I used up three. My log book, which I am sure does not include all of the small-arms bullet holes, shows five missions in which I was hit badly enough to put the aircraft out of action for at least a day. The worst damage was on June 5, 1944, when I was hit dive-bombing and then strafing German vehicles in their retreat north of Rome. The spinner was more than half shot off, and the resulting vibration made it impossible to use more than a small fraction of available power. However, I was able to make it to our emergency landing strip at Anzio, where repairs were made, and the spinner was replaced. After spending a day at the Anzio strip, I flew my airplane back to our home base. Another bad day for my P-40 required the replacement of the right wing when an 88-millimeter shell went through it without exploding, leaving a hole 88-millimeter in diameter. So the P-40 could take punishment; fortunately, I was never hit by a killing round. About seventy of my hours in the P-40 were in the K and M models, which were equipped with the Allison engine. The remaining 150 hours, including the ten in flying school and all of my combat time, were in the F and L models with the much better Packard-built Rolls-Royce Merlin engine. On takeoff we had available fifty-four inches of mercury manifold pressure as opposed to forty-eight in the Allison. The Merlin was much more rugged, and even when overheating would deliver full power. The Allison was likely to cut out when it was overheating, and an engine failure on takeoff, the normally hot time, is one of the most dangerous things that can happen to a pilot and his airplane. All of the P-40s had six 50-caliber machine-guns (the Ls, which normally had four guns, had been converted to the F armament by adding two guns). There was provision for carrying either a seventy-five-gallon auxiliary gasoline tank or a 1,000-pound bomb on a shackle under the fuselage. Under each wing were shackles for three twenty-pound antipersonnel fragmentation bombs. This aircraft was my first love. I developed a sense of confidence in the P-40 that I never had in any other craft. It always brought me back in combat, and our relationship was like that between a cavalryman and his horse. Col. John A. C. Andrews was a fighter pilot in the Twelfth Air Force in Italy and southern France in 1944. He was shot down while strafing a German airfield on his eighty-ninth mission and was held prisoner in Pomerania until May 1945.